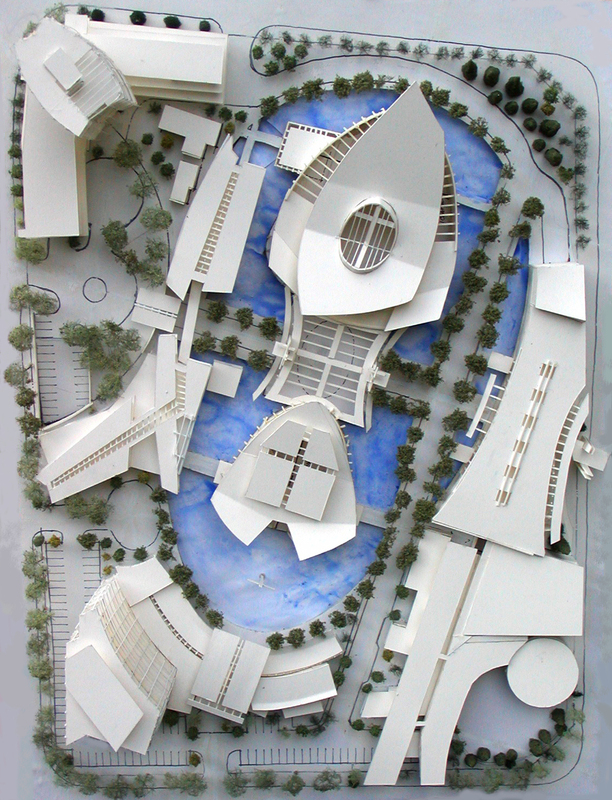 St. Mark's Coptic Canadian Village was an international competition call for an overall master plan that included concept design for a 2,000 seat Cathedral and a 1,000 seat Church. The competition program was diverse totalling almost half a million square feet of comprehensive program spaces for this $200mil project that included: Cathedral, Church, Coptic Museum + Exhibition Centre, K to 12 School, Community Centre and Theatre, Daycare, Administration Centre and Living Quarters, Bakery and Dining Hall, Leasable Office Space, and Long Term Residential Care Facility, with on site underground parking. 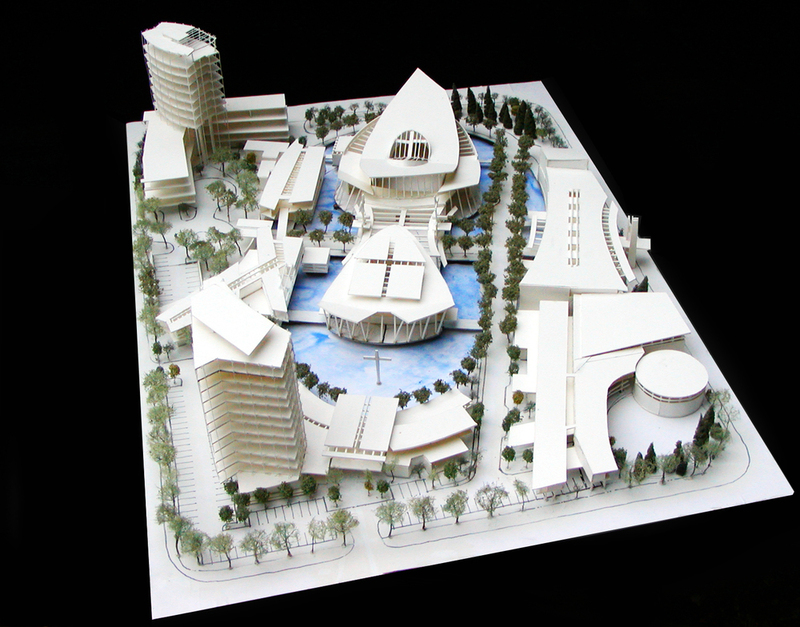 The proposal concept sought to create a wholistic and contemporary master plan that married tradition with contemporary life creating a new image for the Coptic community. The proposal put forth a village master plan whose heart is the symbol of Coptic faith, the house of worship, the ark of faith. 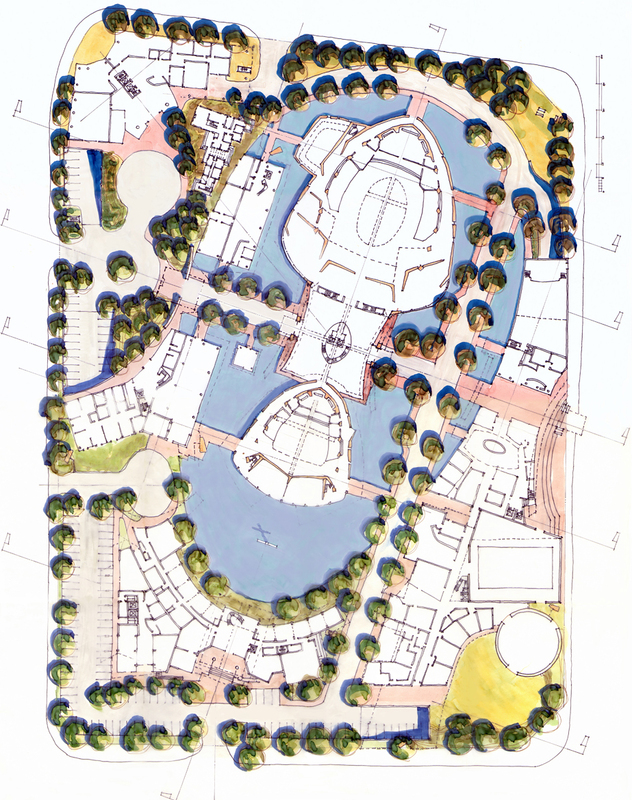 The plan reflects a rich tapestry and texture of building and landscape scales and elements appropriate to the program and a village environment that supports community health, well being, identity and vitality. 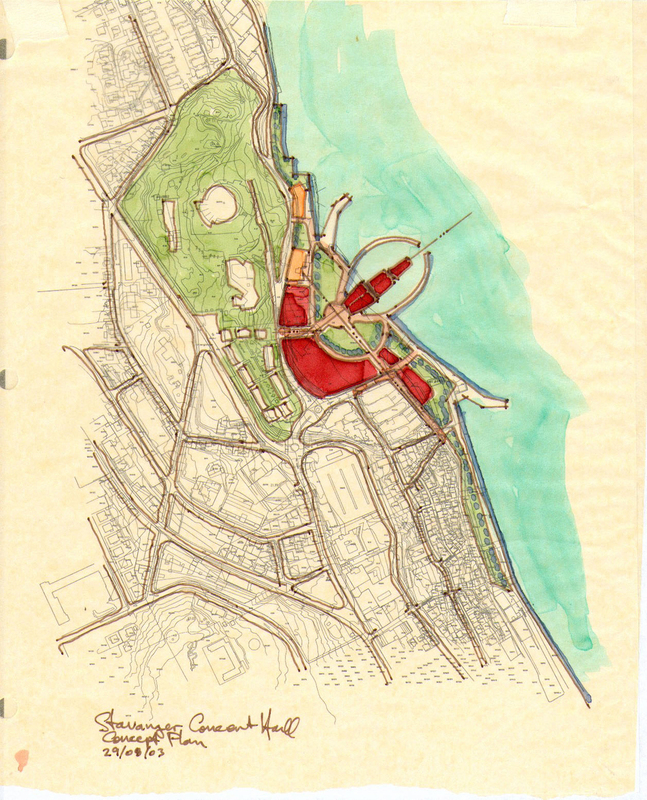 The core of this master plan envisioned the centre and site as a sacred lake-an icon. The lake holds the core expression of the Coptic faith, community, and worship-the cathedral and church. The overall design reflects the physical and symbolic transition between the spiritual realm of the house of worship and the world of community and neighbourhood. The submission was developed in four and a half weeks. There were 197 entries from 35 countries with 64 entries adjudicated in the final round. This international competition aimed at creating a new artistic and cultural image for the region that was high in artistic value and concert hall performance quality. 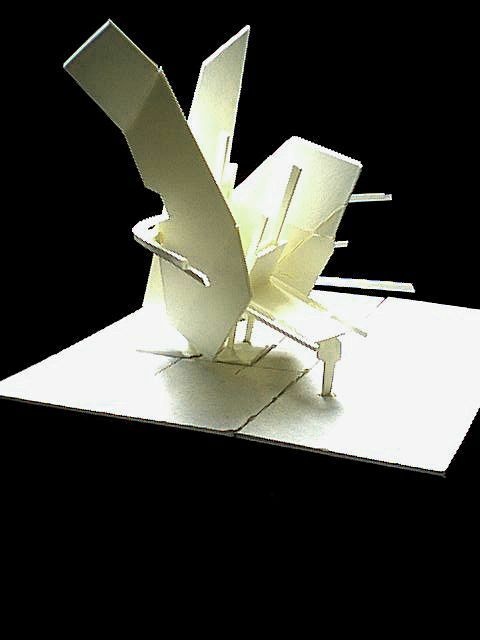 The program brief called for a prestigious building for the region and an attraction in and of itself. 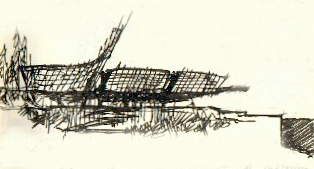 The vision was for Bjergsted to become a national powerhouse in music and art and contain a concert hall of international format. Included in the overall program of 12,825 m2 were: two halls of international top class calibre with a musical breadth from classical to rock music, Orchestral hall with 1,500 seats specifically designed for acoustic music, two halls for 900 seats specifically designed for electronically amplified music, two halls with flexibility for different combinations of seating capacity and stage arrangements, and two halls with standing room for 1,600 - 1,900 when the seats were removed, and a Lobby with spectacular views of the waterfront. The overall facility was to be the new home of the Stavanger Symphony Orchestra with rehearsal rooms and other backstage support facilities. This competition opened just as the St. Mark's Coptic Canadian Village competition closed. The studio commenced four intense weeks of research and concept development leading into a competition design development level presentation. Being a small design studio with active projects and a large international competition just finished and submitted, it was evident that the studio would be unable to complete. The studio decided to withdraw from the competition, but realized in the process strong and valuable design and research collateral that influenced future project work. This competition was sponsored by the Municipality of Whistler to create an interactive and digital Kiosk to create a memorable place through the installation of a significant contemporary artifact that creates a focal point for the existing Village Square, and creates a functional sculptural installation that services the information program of printed and digital media. 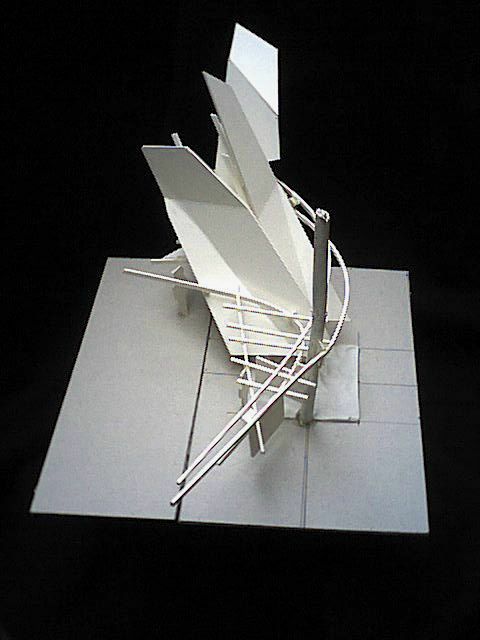 The kiosk was to be a sculptural metaphor for the history, dramatic physical environment, current milieu, iconic of future aspirations and potential, and emblematic of an aspiring world class destination location. The kiosk was to be a day and night event that was inspiring and a contemporary public art piece for a 2010 Olympic contending city. Rise was a vision for a kiosk that unfolds on many levels, a bold piece utilizing steel and wood primary structure, transparent metal mesh panels, glass and ground plane lighting with embedded digital media panels. It was reflective of fossil forms, dramatic and abstract physical geography, stratification of landscape elements, emerging new technologies of ski and board design, and the energy of competition sports. 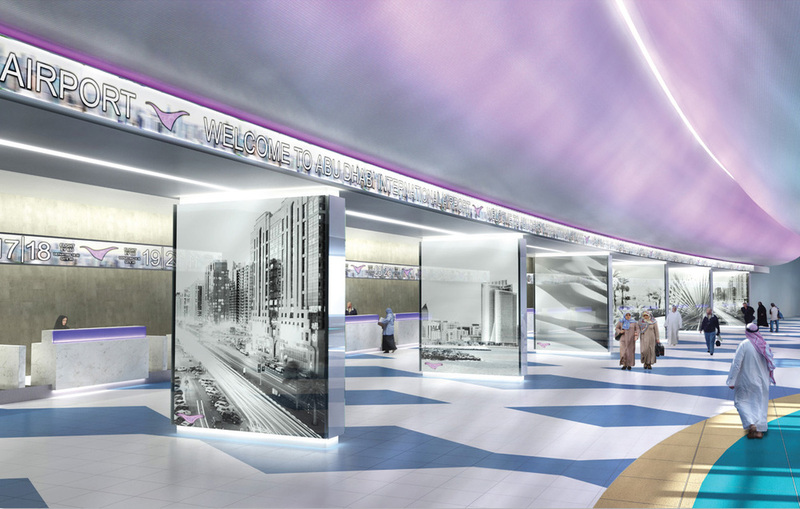 Inspired by the drama and poetry of light that enriches life in Abu Dhabi, this design concept choreographs the experiences that connect passengers to a place with a name that literally translates to "Father of the Gazelle". The concept create a distinctive brand for the airport by using light to enhance way finding and passenger flow and most importantly as the symbolic thread for tying together an eternal and captivating story of life, land and change in Abu Dhabi. For both terminals, the tale begins with the celebration of arrival on the Great Boulevard. Here, procession and royal pageantry are referenced with alternating palm trees and sculptural natural gas lanterns set to a formal rhythm. By day, passengers experience the shimmer of light and shadow filtered through palm trees, and at night, the dancing flames set against the desert sky mark arrival. 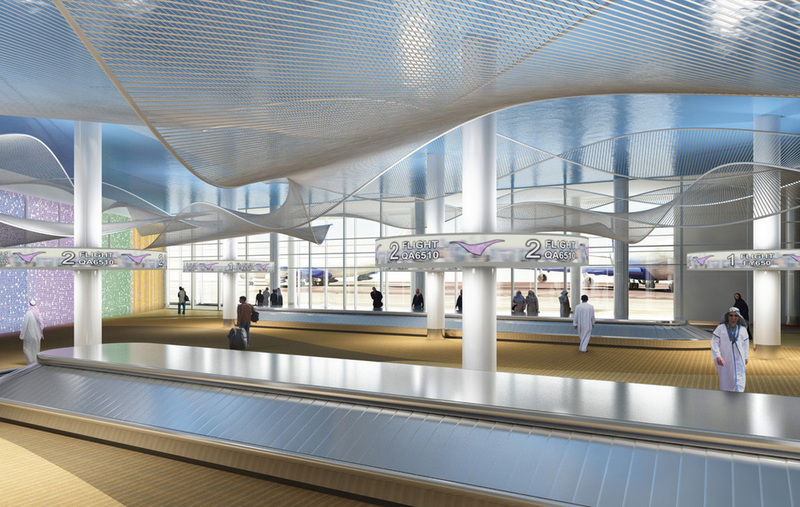 The competition program called for a complete renovation and overhaul of the terminal interiors, planning, circulation, security, and baggage hall areas as well as the terminal gates. The existing commercial service hub was part of the renovation building on the existing circular form recreating an environment of spectacular experience. 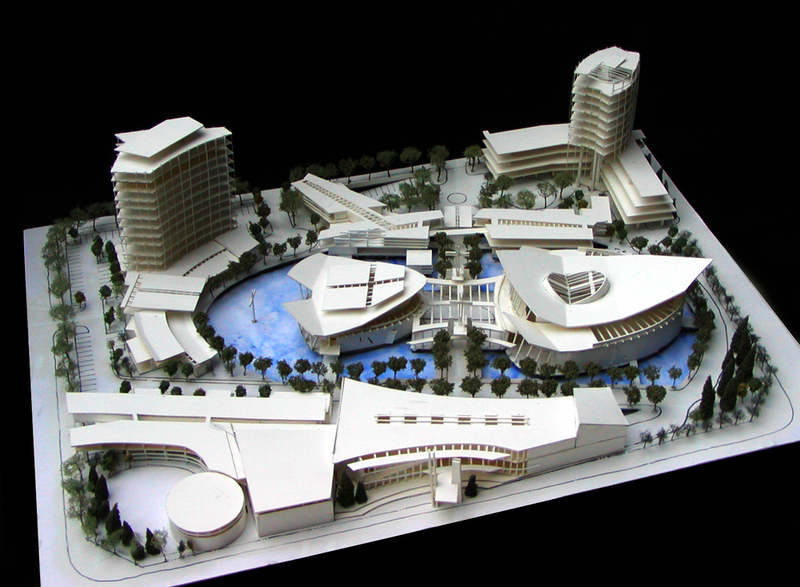 The project was delivered in four weeks with the design being developed through traditional visualization techniques like sketching and precedent images and dynamic iterative modelling / rendering.